Canada: land of ice and snow, extreme politeness, aggressive hockey brawls, houses without locks and zero crime, eco-friendliness and hybrid cars, maple syrup, colorful currency, elephant-sized moose and bears, majestic mountains and endless forests, indigenous cultures that can communicate with animals, bitter cold and windy winters, the magical northern lights, mounted authorities on horses, herds of reindeer, and perhaps even Santa Claus and his elves. When U.S. citizens move to Canada, they come to expect to find certain things from hearsay and movies. Whether or not they turn out to exist is a different story. What I did not expect when I moved from Colorado last month to accompany my fiancé for his graduate program was the unparalleled outpouring of warmth, community spirit, and welcoming invitations I have received from those I have been fortunate enough to meet already. When I contacted the Edmonton and Area Land Trust to ask about volunteer opportunities, no one questioned my motives, where I was from, or what I could offer. They simply extended an invitation and their heartfelt appreciation simultaneously for my interest. As a conservation photojournalist who has most recently been working in the Amazonian region of Ecuador, I felt a bit out of my element as I prepared for my first day out with EALT coordinators and volunteers in early November, the beginning of the legendary cold weather period I had heard so much about. I had no idea how to dress for this climate nor how I would feel not knowing a single person and having coming from the U.S., which often makes me a target for impulsive outside judgement because of the political drama that plagues my country. Yet, I once again received an incredibly reassuring email explaining everything that I needed to know for our outing, and from the very first moment that I met the crew, I felt accepted and meaningful, knowing that I had found a place I could truly belong in this unknown new world. Glory Hills, as tranquil as a dream. Arriving to Glory Hills was the escape from the city that I hadn’t realized I even needed. With winter imminently approaching, it was a brisk day, but the beauty and tranquility of the ponds and woods through which our jovial group of volunteers adventured looking for nest boxes distracted me so that the freezing temperature did not even register. After brief introductions, I realized how eclectic the individuals were who came to donate their time and efforts that day. All of them so experienced in such various fields from mass communications to political activism to volunteer travel. It was humbling, inspiring, and a bit overwhelming at first. But soon began the conversations, and I felt that warm wave of acceptance and mutual respect envelop everyone. I belonged there. Age, gender, social/economic background, professional experience—there was not the slightest bit of attention paid to any of these typical filters used for social judgement. We were sincerely collaborating for the betterment of the natural world around us, each doing our part, resolving momentary conundrums and preparing homes for next year’s feathered families. Meghan Jacklin, Stewardship Coordinator at EALT, works with volunteers to assess if any creatures have been living in the nest boxes, which have been found to be inhabited by flying squirrels rather than birds this time of year. 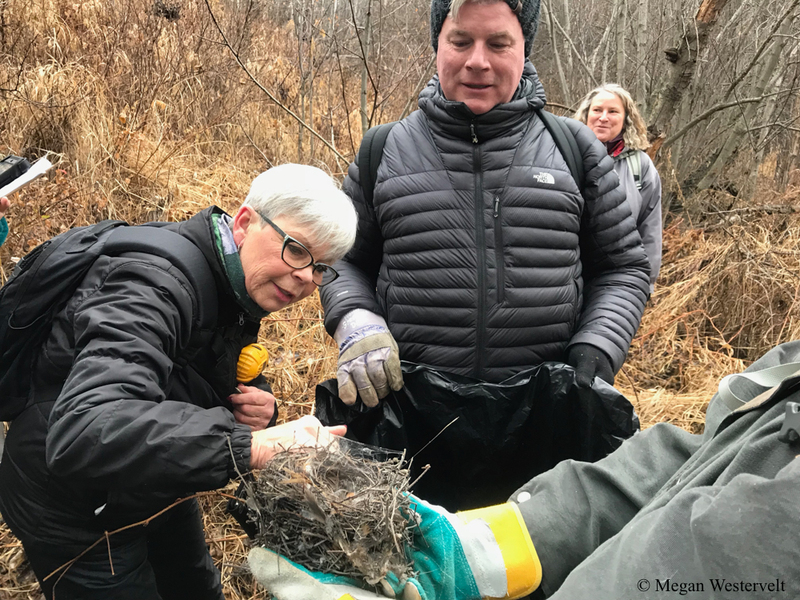 Volunteers Glenda and Gary analyze one of the nests recently removed from a nest box as part of the preparation process for the local swallows, black-capped chickadees, and other bird species in the area who may return next nesting season. Evidence of beaver activity was everywhere at Glory Hills, along with occasional sightings of the critters themselves swimming in the ponds. Getting so close to nature makes one truly feel part of the ecosystem, not merely an observer or passerby. Growing up as the daughter of a brilliant geology professor, time spent in the outdoors was always an educational experience, although discussing relatively stationary natural elements sometimes left me yearning to know more about the living and breathing systems around me, as well. Over time, I have begun to seek more and more knowledge about the ecosystems wherever I go, and working with EALT staff allowed me to fulfill that quest. Witnessing the various types of nests, treefall left by beavers, bat boxes, and geocaching clues gave me the opportunity to get to know species and outdoor activities I hadn’t ever heard of before. I also gained valuable human contacts, many of whom I hope to continue collaborating with for professional projects. More than anything else, this volunteer opportunity connected me with nature again, which we all need more than ever before. EALT’s Assistant Stewardship Coordinator Cassandra Brooke (in yellow) helps volunteers hunt down the geocache box hidden in Glory Hills to ensure the accuracy of its GPS location. Môswa the Moose poses for the photo as EALT’s ever-charismatic mascot. A volunteer with Cree heritage helps to install the new sign bearing the recently selected indigenous name for Glory Hills: maskihkîy meskanaw. 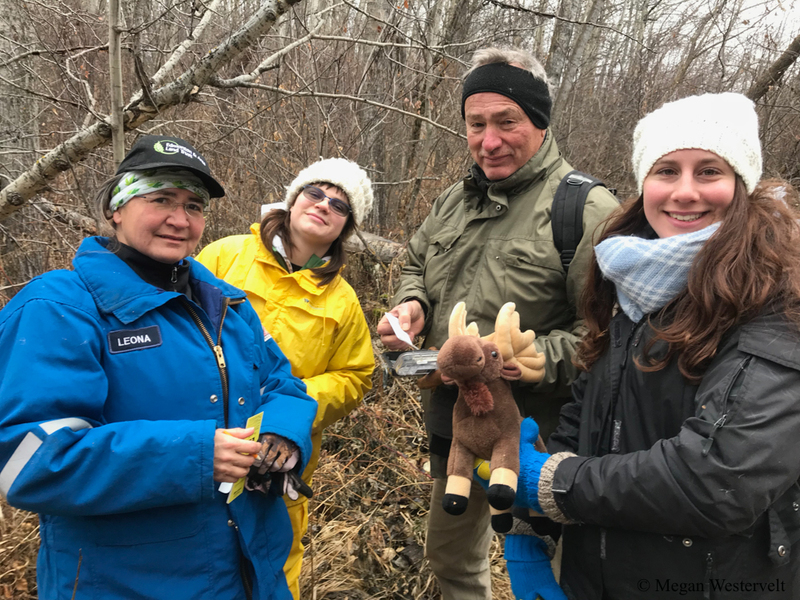 Thanks to collaborative efforts between EALT, amiskwaciy Academy, and MacEwan University, those who visit can once again connect with the area’s ancient roots. If I could share one lasting thought with anyone, local or otherwise, who is considering spending volunteer time with EALT, I would emphasize that now is the perfect time to get involved. No matter the scope of the difference you make, your efforts will undeniably benefit the creatures with whom we share a community, and that community is valuable beyond all measure, not only for its intrinsic worth, but also for our mere existence.